The new poll of Connecticut by Public Policy Polling (D) finds that independent Sen. Joe Lieberman’s approval rating is absolutely in the dumps after his actions in the health care debate, with him having antagonized every group imaginable by both weakening progressive efforts and then voting for the actual bill. 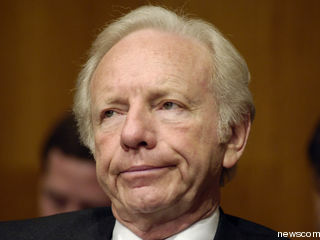 Lieberman’s overall approval rating is only 25%, with 67% disapproval. Democrats disapprove of him by 14%-81%, Republicans by 39%-48%, and independents by 32%-61%. Only 19% approve of his actions on the health care bill, with Democrats at 8%-80%, Republicans at 26%-55%, and independents at 30%-59%. Among those who support the bill, 84% disapprove of his handling of the issue, and in addition 52% of the people who don’t support the bill also disapprove of Lieberman’s actions. This entry was posted in Uncategorized and tagged health care, Lieberman, Traitor, unpopular. Bookmark the permalink. only a weasel blames others and not themselves. Traitor and terrorist joe how many policies have you supported that have maimed and killed people.